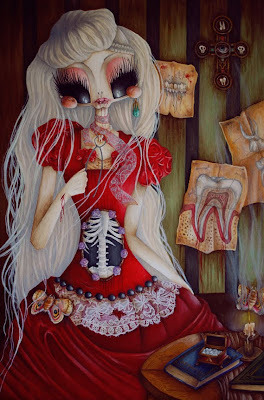 "Berenice", my piece for the London Miles 'Literal Eyes' show, inspired by the novel "Berenice" from Edgar Allan Poe. I discovered Edgar Allan Poe at the age of 13, thanks to my French teacher. Poe is a great artist, by far my favorite writer, I have read all of his books and never get bored. If I chose to recreate "Berenice" for this exhibition, it is first because this novel is one of the first i had the chance to read, and then it is, in my opinion, one of the strongest novel Poe ever Wrote! Poe express through this strory a lot of feelings, he speaks in his own way of madness, love, life and death, old age, sickness. It is dark, beautiful, terrible, and full of symbolism. The main subject of this novel is the tooth: Teeth are fascinating, they evoke so much in our everyday life, in the history and religion. Teeth are a symbol of life, of good health, of beauty. If you lose your teeth, as it is said in the novel, it is then a symbol of death, old age, loss of innocence, sickness, loss of feminity, fear. Working on such an interesting and symbolic subject was more than great for me, it couldn't be more perfect for my morbid and psychotic style.